There's an old story of how it was decided by the United Nations or whatever international organization that the Israel Arab conflict needed to be resolved once and for all. The way they would do it was with a dog fight. Each side was given five years to breed a "super" dog. The two dogs would fight it out to the end. Whichever dog would win the dogfight, would win the entire war on behalf of his side, Jewish or Palestinian. The Arabs went off with the Germans and bred the most incredible beast imaginable. They crossbred Rottweilers, Rhodesian Ridgebacks, Great Danes and Staffordshires. After a number of generations they finally produced the most vicious dog that ever lived. After five years, the two sides met at the appointed time and place. The Israeli side released (what looked like) a big Dachshund into the arena, to the mirth and scorn of the Arab side and of the United Nations officials. The Arab dog was released and started dancing around the hapless Dachshund who just followed the Arab crossbreed with its eyes, not moving its body or its legs. After dancing around for a few moments, the Arab dog decided to go for the jugular of the Israeli hound. As it neared the Dachshund's face, the Dachshund opened its mouth wide and swallowed the German beast, whole. The audience was in astonishment -- they were in amazement, in dread. It was awesome. What a shock! truly shocking. "How did you do it? ", they asked. We spent five years breeding the most vicious dog in history and your dog just swallowed him, in one gulp. The Israelis answered that they had spent the previous five years breeding a crocodile to look like a canine. Last year I was driving though the countryside in northern Thailand, on the road from Chiang Rai and the Myanmar border at the Golden Triangle. As we were cruising along I noticed a strange monument. I asked my guide to stop. There was a statue of a man sitting on a chair surrounded by some lions, tigers and roosters. This was indeed an odd, but at the same time, quaint memorial. What was the story? It seems (and this supposed to be a true story -- after all there is a memoral ) that a couple of hundred years ago there was a state of continuous war between Thailand and Burma. 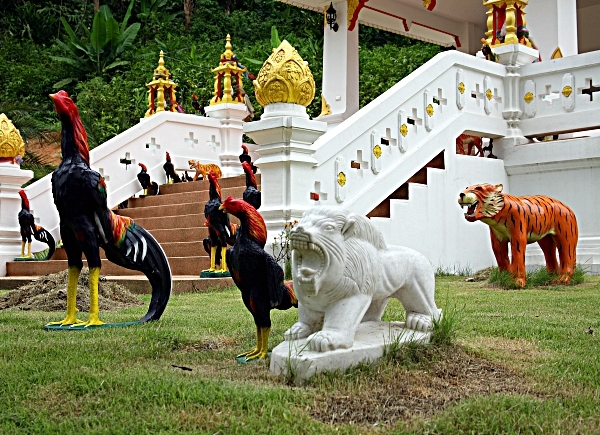 The King of Thailand's hobby was breeding roosters for cockfighting. He said to the King of Burma, "We're at always at war on and off, a major battle every few years, young men on both sides are dying for no reason -- let's finish this off once and for all with a cockfight". And that's what they did! Who said the truth isn't stranger than fiction? It was actually Mark Twain. He said, "Truth is stranger than fiction, but it is because Fiction is obliged to stick to possibilities; Truth isn't." Twain, real name Samuel Langhorne Clemens, was some guy. Many quotable quotes. Here is a photograph of the memorial.